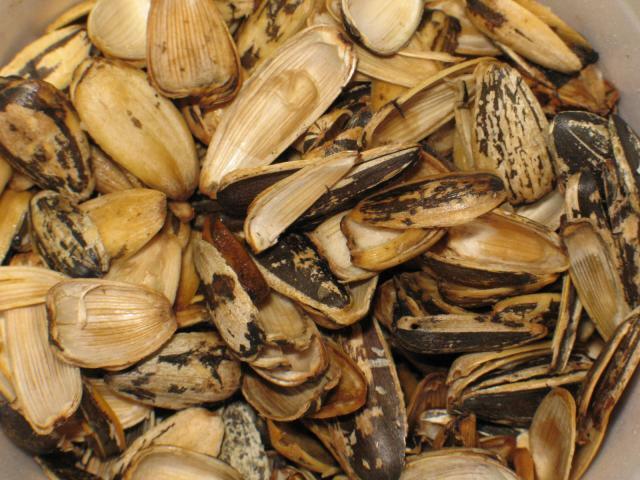 Sunflower hulls are the by-product of the dehulling of sunflower seeds before they are used for oil extraction or as bakery ingredients (AAFC, 2007). Sunflower seeds contain about 20-30% hulls that are often removed before oil extraction due to their deleterious effects on oil presses and because they reduce the quality of both oil and meal (Kartika, 2005). Decreasing the hull content by 1% improves pressing capacity by 2.5%. A well-managed dehulling process yields seeds with 8-12% hulls remaining on the kernels (Campbell, 1983). 100 kg of seeds having 25% hulls yielded 16.5 kg of hulls in an experiment where 66% of the hulls were removed (Carré, 2009). Dehulling is done after cleaning the seeds and drying them down to 5% moisture, which facilitates kernel-hull separation (Kartika, 2005). The usual process consists in cracking the seeds by the mechanical action of centrifugal or pneumatic shellers. The resulting blend is winnowed to separate the hulls from the kernels. 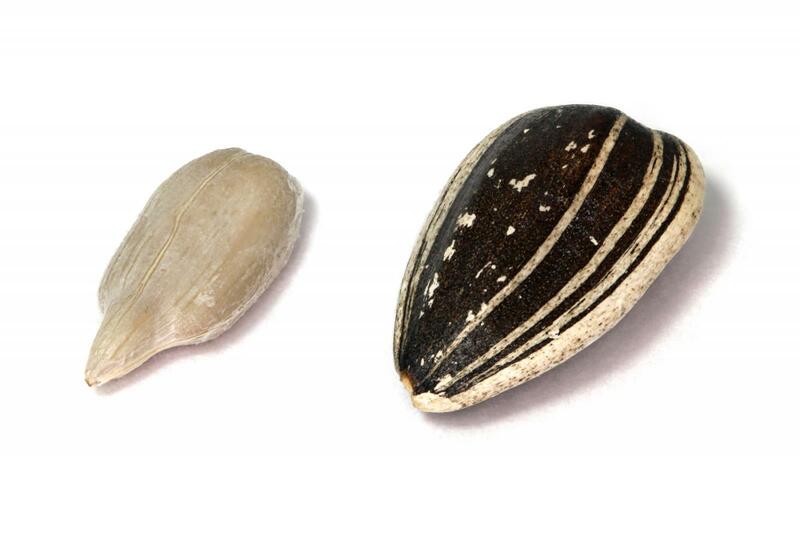 In new sunflower varieties, breeders have enhanced oil content at the expense of hulls, resulting in seeds with thinner hulls that are difficult to remove: these varieties remain undecorticated and do not yield sunflower hulls (Carré, 2009; Grompone, 2005; Campbell, 1983). Sunflower hulls are light in weight and bulky, and are, therefore, costly and impractical to transport. They are burned as fuel to power oil mills but only half of the hulls available can be used on-site for energy production. The remaining half has to be transported off-site, to provide energy or for other purposes, such as composting, bedding material, or as a low-quality roughage for livestock (Dorrell et al., 1997; Carré, 2009). Sunflower screenings are a mixture of variable amounts of residues including hulls, groats, lightweight or broken seeds, heads, sclerotia bodies, weed seeds, chaff, joints, straw, elevator dust and floor sweepings (Lardy et al., 2009). Sunflower hulls are costly to transport because of their low density and are then only available close to sunflower oil mills (Dorrell et al., 1997). Some mills grind the hulls into a flour, resulting in a denser product (250 kg/m3 vs. 70-100 kg/m3) that is easier and less expensive to transport (Borredon et al., 2011). Sunflower hulls are a highly fibrous ingredient, rich in insoluble non-starch polysaccharides. They often contain more than 50% crude fibre or ADF, 70-85% NDF and 15-25% lignin. The protein and oil content are low but not negligible (about 7% and 5% respectively) due to variations in the amount of kernel fragments. Sunflower hulls have a low nutritive value for all animal species and are mostly used for animals that have specific fibre requirements, such as ruminants and rabbits (Cancalon, 1971). The nutritive value of screenings will depend on the included amount of fibrous materials such as stalks and hulls, as in large amounts these will reduce the nutritive value. According to the proportion of whole seeds and groats, protein and fibre content may be equivalent to good quality hays or higher (Lardy et al., 2009). Their composition is close to that of hulls, with more protein and oil and less fibre when seeds fragments are present in larger amounts. Sunflower hulls are a very poor quality roughage with a high fibre content and a low digestibility (DM digestibility 18%; Alibes et al., 1990). Consequently, limited amounts of sunflower hulls should be included in diets (Dinusson et al., 1973) and should constitute less than 50% of the total roughage (Sharma et al., 1988). They are well consumed when finely ground and included in pelleted feeds (Dinusson et al., 1973). Alkali treatments (NaOH, KOH or NH4OH) do not improve the nutritive value of sunflower hulls unless high doses are used (Sharma et al., 1988). Sunflower hulls may be included at up to 20% to increase the total fibre content in the diets of dairy heifers or to provide roughage in high-grain rations for growing or finishing beef cattle (Lardy et al., 2009). Sunflower hulls included at 10 to 40% of the diet decreased nutrient digestibility (DM, CP, ADF). At 27%, the average daily gain was 1360 g/d and the feed efficiency was higher than for the control diet (+ 21%). A higher level of sunflower hulls in the diet (50%) was detrimental to DM intake and growth (Park et al., 1982). Unground sunflower hulls introduced at 5 or 10% as roughage in the diet of fattening steers (374 kg) resulted in lower daily gains and DM intake (1240 vs. 1500 g/d and 0.766 kg/d vs. 0.840 kg/d respectively). However, using sunflower hulls could be cost-effective at this inclusion rate (Pritchard et al., 1990). In growing lambs, untreated or alkali-treated (NaOH, KOH or NH4OH) sunflower hulls included at 25% of the diet (replacing the same amount of alfalfa hay) had no effect on DM intake (1.1 to 1.5 kg/d), DM digestibility (63-66%) and daily weight loss (-0.11 kg/d) (Sharma et al., 1988). Sunflower hulls are not a suitable feed ingredient for growing pigs due to the large amount of insoluble fibre that they contain. However, sunflower hulls have been tested as a means to prevent or alleviate oesophago-gastric lesions in growing pigs. It was shown that a small amount of hulls (5%) added to a finely ground diet had a positive effect on animal health, but they were detrimental to pellet quality (Dirkzwager et al., 1998). Feeding additional fibre to gestating sows has a generally positive effect on the number of pigs born alive and weaned. Sunflower hulls fed at 22% of the diet to gestating sows resulted in + 0.5 live piglets born and + 0.2 piglets weaned per litter (Reese et al., 2008). A high-fibre diet containing 35% ground sunflower hulls fed to pre-pubertal gilts slowed growth and pre-lactation mammary development but later enhanced sow lactation performance (Lyvers-Peffer et al., 2001). Little information is known about the nutritive value of sunflower hulls in poultry. Up to 4-5% sunflower hulls can be introduced in broiler diets without negatively affecting performance, or the size of the digestive tract (Arija et al., 1998; Viveros et al., 2009). In 2016 it has been shown that the inclusion (2.5-5%) of insoluble fibre sources such as sunflower hulls improved ADG and feed conversion ratio in broilers (0-21 day-old) fed low-fiber diets, particularly if the diet was pelletized. Growth performance of young broilers was improved with the addition of sunflower hulls regardless of feed form. Among insoluble fibre sources, sunflower hulls were more beneficial than rice hulls (Jimenez-Moreno et al., 2016). This result was consistent was observations in pullets (0-35 day-old) which received 2-4% sunflower hulls as a source of lignified insoluble fibre and had better feed intake and growth performance (Guzman et al., 2013). Moreover, it was suggested that the inclusion of fibrous material in chicken diets could improve gut health, and it was shown that the inclusion of small amounts (3%) of sunflower hulls could improve digestive tract traits and increase AMEn of the diet in 21-day old female broilers and pullets (Kimiaeitalab et al., 2018). However, sunflower hulls are not a good ingredient for poultry: dehulled sunflower meals have a better ME than non-dehulled meals and there is a very strong negative correlation between the ME value of the meals and their fibre content (Villamide et al., 1998). In rabbit feeding, sunflower hulls can be considered as a safe ingredient. They are mainly a source of fibre, valuable for their very high lignin content. In compound feed diets, adding sunflower hulls makes it possible to reach the minimum level of lignin recommended for maintaining the digestive health of rabbits (minimum 5.0-5.5% according to the type of rabbits; Gidenne et al., 2010). The incorporation of sunflower hulls in the diets of growing rabbits reduces mortality caused by diarrhoea (Gippert et al., 1984). However, their contribution to energy supply is reduced because of their low energy digestibility (20 to 25%), normally associated with the high lignin level. The DE of sunflower hulls is about 4.4-5.5 MJ/kg DM. Similarly, the protein supplied by sunflower hulls is low as a poor protein content is combined with questionable protein digestibility values (measured values vary from 20% to more than 100%; Fernandez-Carmona et al., 1996; Gippert et al., 1988; Garcia et al., 1996a). In balanced diets, the inclusion rate of sunflower hulls can be increased up to 15-20% without reducing growth and feed efficiency in growing rabbits (Martina, 1983; Gippert et al., 1988; Nicodemus et al., 2002), and reproductive performance in breeding does (Nicodemus et al., 2007). For experimental purposes, sunflower hulls were incorporated at up to 24 and 32% of the diet (Garcia et al., 1996a; Beltran et al., 1984; Chamorro et al., 2007), and in one trial at up to 62% (Garcia et al., 1996b) without causing health problems. Viveros, A. ; Ortiz, L. T. ; Rodriguez, M. L. ; Rebole, A. ; Alzueta, C. ; Arija, I. ; Centeno, C. ; Brenes, A., 2009. Interaction of dietary high-oleic-acid sunflower hulls and different fat sources in broiler chickens. Poult. Sci., 88: 141-151.